As the advancements in the implementation of single light-quanta exchange in the quantum channels is constantly progressing and refining, one may think that the quantum communications (QC) will soon widespread in everyday life. The appeals of this perspective may be synthesised by choosing the quality versus the quantity or to encode information in the quantum state of a single particle instead of sending a large bunch of photons to express just one bit. But quality has its price. Each photon that is carrying information has to be clearly sorted out from these wandering around as general background, and its quantum state has also to be kept unblemished along its propagation until the receiver. As expected, QC had its cradle in the research labs, where effective countermeasures against decoherence and background photons are relatively easy to adopt. Significant steps were done in quantum communication along optical fibres, for which already viable technologies were proposed for the distribution of cryptographic keys over legs of several tens of kilometres. In the free space counterpart, where a beam with the train of quanta is aimed toward a received with no needs of infrastructures in between, the difficulties are stronger. The intense backlights, the atmospheric turbulence, the diffusion and absorption of light are some of the issues to fight against in order to implement QC. Beside, the Earth curvature set a final limit to the leg length. The actual limit is represented by a quantum channel in which the nature of quantum entanglement has been demonstrated between two parties separated by 144 km. The experiment was done between two islands of Canary archipelagos, with the stations located quite high in the mountains. But the further extension of the free-space QC has a natural direction: going in space and communicate with the Earth. Indeed, in our experiment we aimed to establish a link between an orbiting source of single photons and a ground telescope. Our team was set up with my coworkers at the LUXOR Labs at DEI, University of Padova in Italy and colleagues in Austria, of the group of Anton Zeilinger at the University of Vienna and Academy of Science of Austria, of the group of Cesare Barbieri at the Astronomy Department of University of Padova, Italy and of Giuseppe Bianco of Italian Space Agency in Matera. The realization of this link is the first step in the communication space-ground or space-space and based on the coding of the bits of information in the quantum state of a photon, or qubit. The experiment also demonstrated that present technology is mature enough for this purpose, and the crucial crossing from the theoretical predictions and the experimental demonstration was possible. On the other hand, the experiment required a combined effort from different expertises, from classical Optics, to satellite laser-ranging for Geodesy, to Quantum Optics, to advanced electronics. Our team synthesized these points of view and succeeded in the single photon link. More in detail, in this experiment we have essentially simulated a quantum communication source onboard a satellite, and showed how the very dim signals could be detected. Such a quantum source has to fulfill the particular requirement, that only one single photon per pulse is emitted. 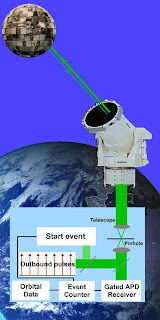 In this work this is realized by sending a rapid sequence of weak laser pulses (outward pulses in the figure) towards a Japanese satellite equipped with retroflectors (Ajisai) at about 1600 km of slant distance. There is a very small probability that the photons hit the satellite and are reflected back to ground, therefore this is just as if we would have a suitable quantum source on the satellite. The main challenge was to detect the very view reflected photons amongst a huge background signal which is exactly the same situation is would be if we had the real quantum communication system. The detector is an avalance-photon-detector (APD) connected to a timing circuit. the orbital data of the satellite were used to identify the returned photons out of the background. The next step will be to board a quantum sender on a satellite. This will allow quantum physics experiments over distances impossible on ground. In particular, it will push the limits of fundamental physics tests addressing experimentally questions as if there is a spatial limit to the entanglement, the "spooky" action? Beside, technologies as the quantum key distribution may be implemented on a global scale. And a real economic impact of the quantum communication from satellite may be expected, to be based on the cryptography, on novel paradigms as quantum teleportation, on advanced atmospheric monitoring, based on the modification of the optical signal during the downlink. There could also be impact in the global distribution of temporal information, as in the case of the so called “legal time”, and advanced methods for the clock synchronization using entangled photon pairs. The study of the quantum satellite is ongoing, under the auspices of Italian Space Agency as well also of the European Space Agency, and we really hope that the quantum satellite will soon be on its way, that is along an orbit some hundred kilometres above us. New J. Phys., v10, 033038 (March, 2008) [IOP select paper], Abstract Link. New J. Phys., v4, 82 (2002), Abstract Link. D Bouwmeester, A Ekert, A Zeilinger, (Springer, 2000).